GRAND JUNCTION, Colo. -- Hometown favorite Coco Montes belted two homers to power the Pioneer League to their first All-Star victory over the Northwest League in four tries, a 13-10 win before a crowd of 4,892 fans on Tuesday at Suplizio Field. The 32-hit battle featured three homers and six lead changes. 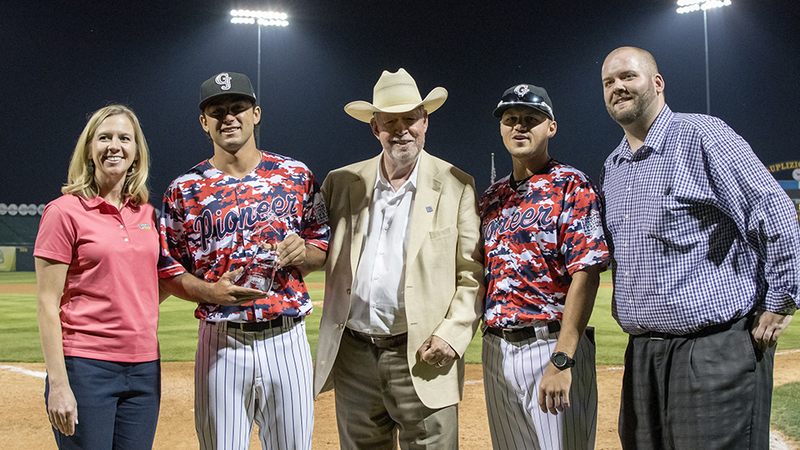 Montes' six-RBI night earned him BUSH'S® All-Star MVP honors for the Pioneer League, while Salem-Keizer's Diego Rincones took home the Northwest League award with a four-hit performance. "It's amazing," Montes said. "Our crowd is awesome. Our fans, them cheering me on every time I get to the plate." Grand Junction closer Alexander Martinez notched the save in relief of Missoula's Deyni Olivero, the Pioneer League's 10th pitcher who recorded two outs. Eugene's Sean Barry took the loss after an eventful eighth inning. With the Pioneer League trailing, 10-9, Helena's Nathan Eaton hit a popup to shallow right field that landed between first baseman Curtis Terry and second baseman Connor Kopach before rolling into the bullpen for a double. It was his fifth hit of the night. "Sometimes you just have those days when the ball just goes your way," said Eaton, who fell a homer shy of the cycle. "I wasn't really thinking about the home run, just getting our team back in it." Jeremy Arocho singled home Eaton with the tying run and Buddy Kennedy walked. With runners at first and second, Emmanuel Clase came on in relief and misplayed a ball off the bat of Grant Lavigne for an error. Arocho and Kennedy both scored when Clase made an errant throw to third and Lavigne came home on a single by Daniel Robinson. "It was wild," said Terry, who had three hits after winning Home Run Derby earlier in the day. "The first inning, we got five and I was like, 'This is good.' Then they came back. ... It was crazy." It looked good early for the Northwest League, whose first five batters reached against Pioneer League starter J.C. Cloney. Diosbel Arias led off with a single and Andy Yerzy went the opposite way with a ball that just stayed fair and landed on the warning track for a double, setting the stage for Joey Bart. The Giants' top prospect fouled off three pitches, then clobbered a 2-2 offering for a three-run homer. Owen Miller and Olivier Basabe followed with RBI groundouts for a 5-0 lead. But the Pioneer League bounced right back against Tri-City's Henry Henry, who allowed a leadoff single to Eaton and Montes' first homer. "The first one, I was ahead in the count, so I was trying to be aggressive," said Montes, who has seven homers for Grand Junction, including six at home. "I got a good pitch, hit it the other way." After doubling and stealing third in the second, Vancouver's Tanner Kirwer scored on a wild pitch to extend the Northwest lead to 6-2, but the Pioneer League answered again in the bottom of the frame. Ogden's Ronny Brito singled off Cobi Johnson and scored on Eaton's triple that was misread in left field by Rincones. Montes plated Eaton with a grounder to short as the Pioneer League pulled to within two. "The past few games before the All-Star Game, I was seeing the ball really well," said Eaton, who went 5-for-5 with four runs scored and two RBIs. "I think it just carried over." David Fry drew the game's first walk in the fourth and Eaton threaded a single under the glove of pitcher Michael Plassmeyer to put runners at the corners for Montes, who didn't waste the opportunity. With the count full, he stroked a laser down the right field line for his second dinger and the Pioneer League's first lead of the night, 7-6. "A 3-2 count and we had a man on third, so I was trying to fight something off, put the ball in play. One out, get the run to score," Montes said. "I got enough barrel and it went over the fence." The lead was brief, however. Terry led off the fifth with a single and Rincones doubled. Miller's sacrifice fly, his second run-scoring out, plated Terry and Rincones dashed home on a wild pitch by Marcos Tineo to put the Northwest in front, 8-7. That lead last four batters. Fry hit a towering fly to the base of the wall in left-center, scoring Zachery Almond to tie it. Leugim Castillo trotted home one out later on Eaton's fourth hit of the game to put the Pioneer back on top, 9-8, but Rincones made a rifle throw to the plate to Bart to nail Fry. "I felt really good having [Bart] there behind the plate and just wanted to make a really good throw," Rincones said. "I feel really happy about [the MVP award] because I can play here. I felt really good about the game and was trying to do 100 percent. An inning later, the lead changed hands for the fifth time. Danny Edgeworth walked and scored on a groundout by Francisco Ventura and Blue Jays No. 17 prospect Griffin Conine came home on a passed ball by Pabel Manzanero, who pegged Conine with his throw as he crossed the plate. Ultimately, however, the Pioneer League finally earned bragging rights. "I was excited to be here," Montes said. "Home Run Derby was fun, but I'm not really a big Home Run Derby type of guy, so I just had fun with it. In the game, I got some good pitches. It was a great time." Jared Ravich is a senior software engineer for Major League Baseball Advanced Media. This story was not subject to the approval of the National Association of Professional Baseball Leagues or its clubs.